At first glance, that might sound like an overstatement, but yeast is truly everywhere around us. Its lineage dates back 100 million years. Invisible to the naked eye, we might not give much attention to yeast. But it’s responsible for some of our favorite food and drinks that we consume on a regular basis. Just as yeast comes with a long history, so do the foods made with yeast, and for centuries, humans have been using yeast for culinary concoctions. One of the oldest? Beer. The world’s oldest barley beer dates back to 3400 BCE, and ever since, humans have been working to master the art of fermenting beer. Today, the process for making beer might be a bit more technical, but the process is the same, using yeast to turn sugars into alcohol. Saccharomyces cerevisiae. Around the turn of the century, we learned how to make that yeast on a large scale, leading to the growth of the commercial yeast industry. This made it easy to standardize the beer making process; brewers could ensure that beer would smell, look and taste the same every time that they made it. Today however, a growing group of brewers is going back to the source, harnessing the power of wild yeast to make their beer, leading to an array of flavors and an embrace of traditional brewing methods. While the history of beer brewing began with using wild yeast, today it’s far from the norm, partly because of the work involved. "Most brewers utilize domesticate strains that are very controlled and predictable," says Robert Horner, owner and brewer at Propolis Brewing in Port Townsend, Washington. "Wild yeast are often unpredictable and less understood." different process than baking with a sourdough starter. It is a process that takes a combination of artistry, knowledge and passion. In the face of standardized, industrial production, making these styles of beer can seem avant-garde. On the contrary, as Peter Kruger, Master Brewer at Bear Republic Brewing Company, points out, it’s what we have been doing for centuries. Nothing could be more natural. "People are usually blown away that there is enough yeast and bacteria floating around in the air to actually ferment a beer. But let’s remember that historically there was no domesticated yeast. It was all wild," says Kruger. "So spontaneous fermentations are really not quite the experiment that folks usually think they are." Spontaneous fermentation, a style of beer making that’s growing in popularity, is essentially letting Mother Nature do her thing. It has gained notoriety because of the rise in popularity of sour beers, or lambic beers. Traditionally, these were made through a spontaneous fermentation process. It’s the acid in a beer which gives it that sour taste, and that acid is produced by bacteria. As Horner notes, those bacteria "can find their way into a brew either by choice or by chance." With the traditional lambics hailing from Belgium, it was by chance, the beer left overnight in "coolships," large open shallow tubs. The liquid was then inoculated with the microbes hanging in the air, and then allowed to spontaneously ferment in barrels. The mecca of this style of beers can be found at Brussels’ Cantillon, and the second that you walk in the door, you are immediately enveloped in the musty, tangy smell of yeast; you can almost feel the microbes in the air. 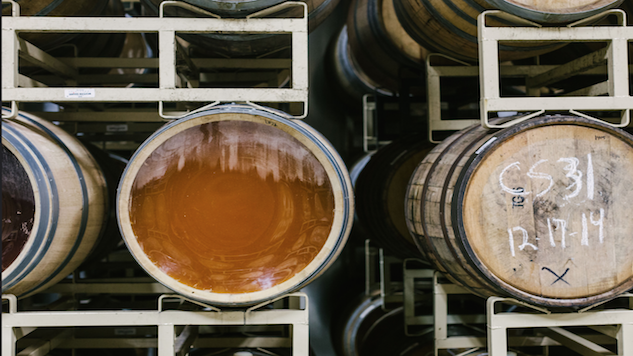 But don’t let yourself be fooled — not all sour beers are created equal. "There are many ways to sour beer, and not all of them use bacteria from a spontaneous fermentation to achieve their tartness," says Kruger. "Brewers can use acidulated malt to create a clean sour beer. Also we can purchase souring bacteria in pure cultures." brewer can take a more controlled approach to brewing with wild yeast by inoculating wort with wild yeasts," says Horner. them that gets some brewers so excited? In the wine world, "terroir" is a common term, meaning the expression of place in a wine. All of the environmental factors – the weather, the soil – that affect the growth of the grapes, lead to different tastes in the resulting bottle of wine. In a similar manner, brewing with wild yeast can also allow a brewer to produce beers that are more reflective of the place that they are brewed in. "With a spontaneous ferment the terroir, or location, of the brewery has a chance to express itself," says Kruger. "The wild yeasts and bacteria native to the brewery’s location have free reign and manifest themselves with all kinds of wonderful (and hopefully rarely awful) flavors and aromas." local and seasonal ingredients in their beers. "I am fascinated by my surroundings and and want to brew ales that reflect my place; that taste delicious and are intriguing," says Horner. flavors you may never have tasted in a beer before – brewing it brings just as much excitement as drinking it. After years of industrial beer production, it allows a brewer to be a bit of a revolutionary, to go against convention. It allows them to break out of the box, and while there is still a lot of control and attention to a variety of details that goes into the brewing process, brewing with wild yeasts allows for "a certain amount of intuition and freedom," says Horner. After all, brewing with wild yeast is, well, a little… wild, for the brewer and even us the drinker. "Open spontaneous fermentation is very liberating," says Kruger. "It feels like that midnight skinny dip, like we’re getting away with something." Anna Brones is the author of The Culinary Cyclist and Fika: The Art of the Swedish Coffee Break, the founder of the print quarterly Comestible, and runs Foodie Underground. Wherever she is in the world, she can often be found riding a bicycle in search of excellent coffee.